Unreal Engine 3 continues to dominate the current development landscape; the popular middleware gained more momentum recently with the news that LucasArts has signed a studio-wide deal that will see all its upcoming titles developed on the ubiquitous Epic platform. In the meantime, the developer itself plans to roll out its most technically advanced UE3 title yet, Gears of War 3, destined for big things when it is released later this year. Despite the emergence of competitors such as CryEngine 3, Epic's position in the engine-licensing market only seems to be moving from strength to strength - a ringing endorsement of its technology, with Alice: Madness Returns the latest in a long line of titles to benefit from its cross-platform credentials. Historically, Unreal Engine 3 games have tended to favour the Xbox 360, to the point where Epic's own Bulletstorm featured a smoother performance level and graphical effects absent from the PlayStation 3 version of the game. Alice: Madness Returns is an interesting example of how other third-party developers are handling the engine: there are clear examples of graphical advantages on each console platform, and while the overall impression is that the Xbox 360 and PS3 versions are very close indeed, there are some notable differences, as the head-to-head movie and the Alice: Madness Returns comparison gallery demonstrate. The first thing that you'll notice is that Alice is a cleaner-looking game on the PS3, with smoother edges and less in the way of subtle aliasing. The jaggies aren't exactly an issue on either version due to the style of the artwork and the colour choices employed, which tend to hide many of the edge artifacts. Both versions of the game render out in 720p and there's no anti-aliasing on the Xbox 360 version, while PS3 owners get the added benefit of a post-process-based AA solution, most likely MLAA. As there is no texture blur in Spicy Horse's implementation, edges and textures are left looking nice and sharp, thus enhancing overall image quality. 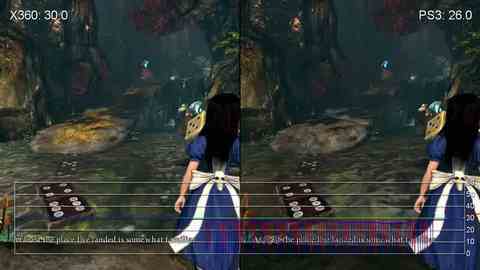 The Xbox 360 version of Alice: Madness Returns has no anti-aliasing, but the PS3 version features a post-process MLAA-style solution that offers edge-smoothing very close indeed to the PC version. Despite the additional memory savings from using MLAA over a more traditional anti-aliasing solution, there are a few examples of missing or pared-back texture details on the PS3 - for example, the lack of grass occupying some of the ground textures. There's also a reduction in specular highlighting (the shininess of a surface) on some effects in a few scenes, such as the lack of sheen on the splashes of the shrinking potion flowing from the fountain near the beginning of the game. The overall visual experience isn't exactly compromised, considering that most of the game appears like-for-like in most other areas, but there are times when specific locations appear slightly more barren due to the changes that have been made. Certain graphical effects and texture details appear to be running with a higher resolution on the Xbox 360 version of the game. The result doesn't impact PS3 Alice that much, though the occasional area can seem a little sparse in comparison. On the flipside, we see that LODs appear to be a touch more refined on the Sony platform with shadows and a few occasional textures loading up a little earlier, no doubt taking advantage of the mammoth mandatory HDD install leading to faster asset streaming. Other than that, there are a few other graphical oddities that crop up from time to time. 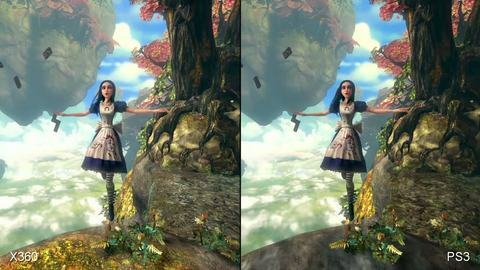 Some alpha-based effects appear to suffer from texture compression issues on all three formats at various points, while some of the shadows cast on Alice can look a little rough when they flicker and glitch in and out of view when moving through the environment, something which occurs more often on the PS3 version of the game. Performance analysis reveals that Alice: Madness Returns is v-synced on both platforms and features a capped 30FPS update, but there is a distinct difference in how both versions operate across the basic run of play. Initially, neither one really deviates from the targeted 30FPS update. We see one or two frames being torn on the 360, and a little more on the PS3, but nothing particularly noticeable at all. During much of our time spent exploring some of the game's imaginatively constructed environments, most of the slight dips in smoothness had very little impact on the overall experience on either platform - both were equally playable. It's only when we move into more detailed areas while battling a group of enemies that we see a fairly large gap emerge. In these instances the PS3 version not only suffers from a greater amount of screen tearing, but many more frames are dropped as well, resulting in some heavy slowdown which serves to dull controller response significantly - in situations like this, gameplay is undoubtedly impacted, and combat is exactly the kind of situation where a consistent frame-rate and controller response is a must. Oddly enough, there are also a few instances where we see a few short dips in smoothness manifesting on the PS3 during times when there isn't much going on at all. Frames are only dropped for a brief second or two, but this results in a visible judder, which disconnects you from the experience, if only temporarily. Thankfully it is only a minor annoyance and not a major blemish in the grand scheme of things. Both 360 and PS3 versions of Alice: Madness Returns are fairly solid overall, each with their own visual enhancements, but with the Microsoft platform claiming the honours from a performance perspective.